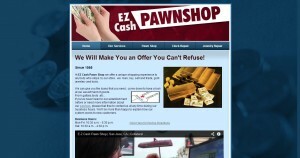 E Z Cash Pawn Shop address, phone, website, hours of operation, and more. At E Z Cash Pawn Shop we offer a unique shopping experience to anybody who stops by our store. we loan, buy, sell and trade, gold jewelery and tools. We can give you the loans that you need , come down to have a look at our assortment of goods. If you’ve never been to our establishment before or need more information about our services, please feel free to contact us at any time during our business hours. We’ll be more than happy to explain how our system works to new customers.